Special Note for Readers of Sakshi : if you typed www.ourplanets.com to visit Planetary Society, India (kindly click here or visit www.ournewplanets.com) to know more. This is in reference to N.Sri Raghunandan Kumar ఎన్. శ్రీ రఘునందన్ కుమార్, ఖగోళ పరిశోధకులు, ప్లానె టరీ సొసైటీ ఆఫ్ ఇండియా వ్యవస్థాపక కార్యదర్శి Article in Sakshi Newspaper titled "చుక్కల్లో చిల్డ్రన్" published on 12th January 2011 . To read online click here. You can also find Astronomy Club india hyderabad andhra pradesh information. Importantly find information of the efforts of Dr.B.G.Siddarth, Birla Science Center (famously known as Birla Planetarium Hyderabad) who since over three decades as been serving people and inspiring many students like Mr.Raghunandan. Freinds this is special article we are responding to the nonsense mail which triggered discussion in web circles particularly cashing on space enthusiasts thirst for understanding cosmos. First we are republishing the article as it is and then go to truth. Watch Brightest in the Sky Online as a photo graphs which is the most waiting for 21st June 2010 to witness a wonderful vision and which may appear next time this close, is in 2287 only. Watch Free YouTube Videos of Star Aderoid - Watch Two Suns Brightest in the Sky Online. Star Aderoid will be the brightest in the sky. Star Aderoid is started from 10th June. Star Aderoid in the sky will look as large as the sun from Naked eye. This will culminate on 21st June 2010 when the star comes within 34.65 miles of the earth. Be sure that you will watch the sky on 21st June 2010 at 12:30 p.m. where you will look like the earth has 2 suns. REMEMBER:- NO ONE ALIVE TODAY will ever see it again. Don't miss it. Watch Star Aderoid will be the one brightest star in the galaxy. This star is so brightest and large so it looks like SUN when you see with your naked eye. You can watch this beautiful eye catching moment on 21st June when the star comes within 34.65M miles of the earth. You can see the Nature greatest magic here !! 2. There are lots of them are there over Web. For all the readers, before we give you in depth analysis on above story we like to very clearly tell you there is no such event happening on June 21, 2010. Importatnly we also like to share the details of the spammers/Hoax have used different recent events in sky and tried to sell/float this piece of non science. So Dont Worry or be fooled or forward any mail containing such information. Who is behind the above story ? 4. People who with commercial interests promoting wallpapers or software (as i have found in above story in one of the sites i first read). Note: the above story has no source from any professional astronomer or organisations who basically work 24 x 7 all through the year or nor even any space agency like NASA, ESA. 1. Is there Any Star Called Aderoid ? Does it really Exist ? 2. "NO ONE ALIVE TODAY will ever see it again"? Is it True ? 3. "Because this magical moment comes in 2287". Is this true ? 4. In the Hoax story it says " its 34.65 miles of the earth. Be sure that you will watch the sky on 21st June 2010 at 12:30 p.m. where you will look like the earth has 2 suns." What would have happen if this was true or really happen ? There is no such Star. We have checked various catalog's but didn't find any star with name Aderoid. Yes when there is no such star. Then no one alive today would ever see it. We can say one thing here.Though this story is filament of Imagination. It will like Mars Hoax Story (comes in august every year) may trouble us every year in middle of year. Yes even if this story was to be real. Just see the figure "34.65 Miles". that is the distance with which it would be from earth according to the hoax story. And the next lines of story say Aderiod would be as big as our sun visible to naked eye. i. If that star would be just 34.65 miles or 35 Million Km then no one on earth would have been available LIVE to see it. ii. The writers of this hoax story say it will be 34.65 miles and also say it will be visible like our sun. Which itself is contradictory. i.e. Sun is 1 A.U. from us hence it is visible as see it now and we are at safe distance. The proposed hoax star is 34.65 miles and the writer says it will be visible like SUN. hence even if the above hoax story were to happen in real it would not because of self contradictory nature of the writeup related to scientific facts. i. NASA report on Geomagnetic Storms , Solar Activity in 2013.
vii. Nemesis based story in recent past this year. 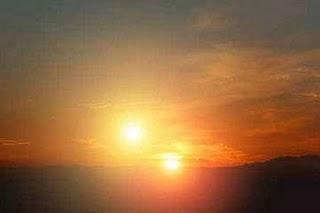 The above could be guiding factors for framing this Two Suns story. Importantly enough has been talked, discussed and written various natural and celestial events. Importantly reviews/Discussions on 2012 based movies also created enough awareness among people. Knowing all this the hoax makers of Two Suns Story framed this story and left to travel across the web by mail, sms etc..just like what they did to Mars Hoax Story. Here is our Youtube Video Explanation of the Hoax Story - NASA/ESA and other videos have been used. BLESSING IN DISGUISE : We for once feel happy with these kinds of hoax stories as they generate sudden interest in understanding the cosmos among general public. However it reminds and bring forward ignorance levels in public. In future we request people to put such stories to test of Scientific Method even before forwarding or start worrying.We kindly request to join or support us to carry our work and communicate science more effectively and efficiently. However we would like to post a Special Article in near future featuring Planets which two or more suns in our universe in a distant system.